Once again I was at the new house today – working a little and supervising a lot. I needed to meet the window guy fairly early and was running late so I put my oatmeal into a plastic container, grabbed my travel mug of coffee, and ran out the door. While the windows were being measured, I sat on the patio under the pineapple guava trees and ate my oatmeal. I noticed that the meyer lemons are really ripening fast and took this photo to share on instagram. The tree is right outside the master bedroom window and it’s my favorite thing in the yard at the moment. I wish I had taken a photo of the patio furniture that we have been using temporarily – it’s quite a collection. There’s a rust-covered round metal table, which is currently covered in bird seed that I spilled while filling the feeders yesterday. It’s also adorned with pineapple guavas that just won’t stop falling. The table will actually be just fine once we sand it down and paint it, but for now it’s a conversation piece. The real gems are the chairs, one of which is one of those grey plastic shower chairs utilized by the elderly and infirm. That’s actually the best chair of the bunch as far as comfort and stability goes. The others are a motley collection of ancient camp chairs in various stages of disrepair and decay. Some are ugly, some are uncomfortable, and some, quite frankly, are probably dangerous. But my family has already gotten together for lunch a few times around that rusted table (the unlucky ones balanced precariously on the worst of the chairs) and it’s been absolutely wonderful. Once I’m sitting down in that shady corner with the birds chirping and hummingbirds buzzing, it’s easy to forget what a horrible mess the inside of the house once was and I can imagine happily living there (perhaps with different patio furniture). I can’t wait to have a barbecue next spring when the camellias and tulip tree are filled with blooms and the patio is covered with potted plants rather than construction debris. I can’t wait to plant a garden and create recipes from fruits and vegetables harvested from my own yard. Lots of progress was made at the house today and I think that we will definitely be moving in before Christmas, which would be wonderful. The painting is just about finished everywhere except for the kitchen and after changing a few things I am now really happy with all of the colors. The windows have now been ordered and will be installed at the beginning of next month, which is earlier than I expected. My dad finished hanging drywall in the kitchen and the painters will go in there to patch and prime tomorrow. My dad and I drove out to the cabinet shop today to check on things and the cabinets look great! They should be installed by the end of the week, which will be a huge step. Our cabinet maker happens to be married to my Dad’s cousin so our visit was also a bit of a social call. It really is nice to be living near my family again and as much as it can sometimes be overwhelming to have everyone so involved in a project like this, I feel extremely lucky to have the help and support. Thanks for following along on this NaBloPoMo journey. I promise to get back in the kitchen soon and share some new recipes. In the meantime, I definitely have my eye on this Pineapple Guava Ice Cream. See you tomorrow! yay to the house coming along in a timely fashion! after seeing the before first hand, i can't wait to see the after! and let's talk about pineapple guava for a second... which does it taste like?!? How exciting for you. A new home and a Meyer lemon tree. 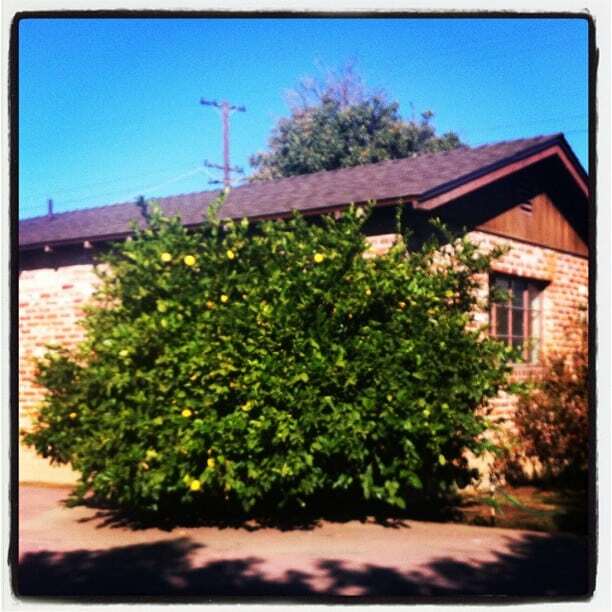 Every home should have a big meyer lemon tree. I'm envious of the size of yours and all those gorgeous lemons. I am living vicariously through your new house project:) I can feel your excitement:) We are a special breed when our hearts flutter at the sight of a citrus tree! I know you'll be happy sitting on your patio surrounded by the bounty you planted - there is no better reward:) Hugs! Wow, that is a beautiful lemon tree. I just happened to make meyer lemon &vanilla bean marmalade the other day. Love the post. Owning a lemon tree sounds like such an exotic luxury. And such a big, beautiful tree, too! Can't wait to hear what you do with all those lemons.